Kids can learn about volcanos, weather, crystals growing, dinosaurs, microscopic science and outer space with this multi-lab science set. A truly complete science set. 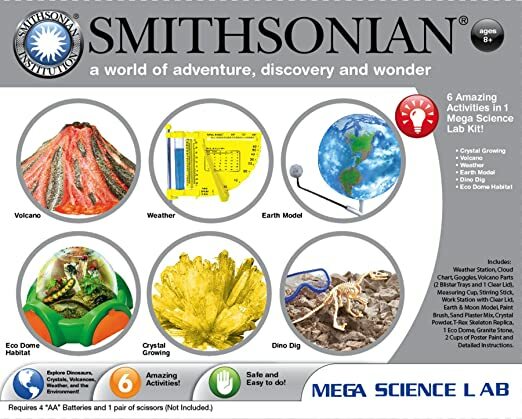 A science real sampler with amazing adventures. Safe and easy to do. Detailed instructions are included. Bought this for my son (age 9) and he LOVES it!!! He has already done the dinosaur dig – it kept him busy for over 2 hours, which is very hard to do!! He was very proud of himself when he finally unearthed the entire dinosaur and got it put together. He can’t wait to do the next project! If you have a kid interested in science, or if you are trying to encourage an interest, this is a great way to start! !